TWINS! BOYS! 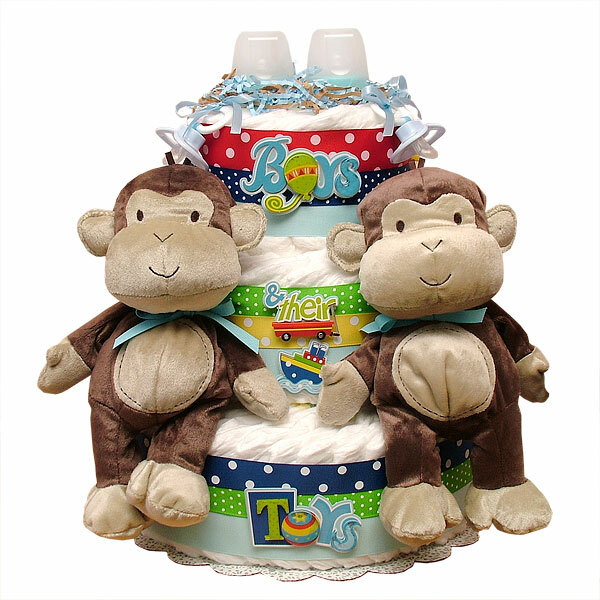 Monkeys Diaper Cake! This fun cake is made of 65-70 Pampers Swaddlers diapers size 1-2 (up to 15 lbs. ), Two soft monkeys toys by Carter's; Two pacifiers, Two baby bottles; Two JOHNSON'S Baby Powder Pure Cornstarch with Aloe Vera & Vitamin E (Gently absorbs excess wetness to keep skin dry and soft) 1 1/2 oz. The diapers are held together by elegant ribbons (no glue on diapers). Ribbons are hand-stitched with white embroidery floss on the back of the cake, allowing for a clean, handmade look. Decorated with ribbons, bows and scrapbook embellishments.There is a cavity inside this diaper cake for your own small gifts. This cake sits on 12" Wilton cake circle and it's more than 15" in height. Comes wrapped in cellophane with coordinating ribbons and bows. All our diaper cakes made of highest quality ingredients with greatest care and love. Everything included is ready to use and easy to disassemble.